Just got a lap steel with legs and I'm using the obvious towel to throw over it when not playing. This keeps the air off the new strings. But it seems that a towel would absorb and hold moisture when humidity is high and will then be counter-productive until it dries out again. Do you guys use vinyl or what (if anything at all) to cover your instrument? 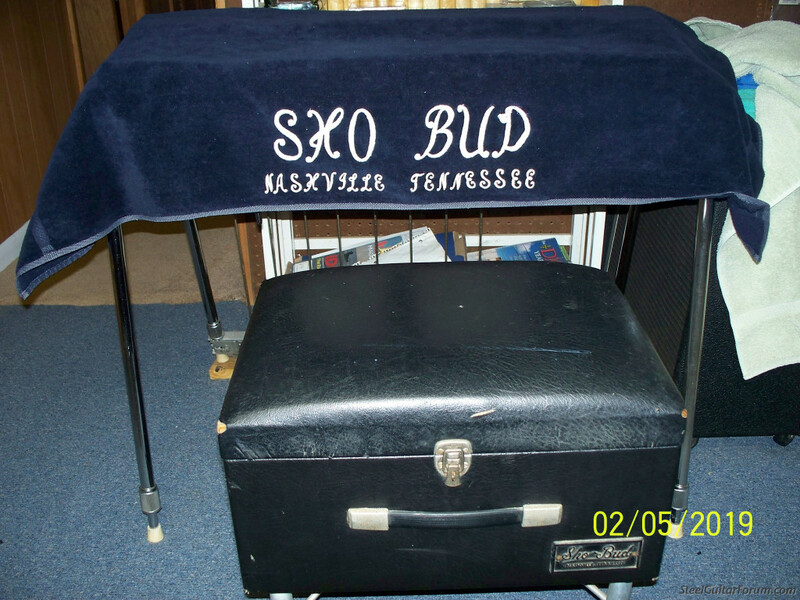 Bobby Seymour used to sell a pedal steel leg bag that was also a guitar cover, it was done up in denim and a very handy and practical item. I found a rectangular piece of canvas at my house. I've been using that as a cover for about a year now. It's not exactly protective, but it keeps it clean. I protect all my instruments with a protective layer of dust. I dust my guitars at least twice daily by playing them. and I don't cover them because I like looking them. They are almost as pretty as I am. I have to admit I rarely use it, but it's nice. reminded me of my practice lap. i have a Gretsch lap that i leave uncovered, and unprotected against my 3y old son, the others are stored in their cases out of the reach of children. When Bruce delivered a new Zum I'd ordered, it came with a nice felt cover, bless his heart. I have made several covers for my pedal steels over the years... it's very simple: buy part of a yard of fabric cut out a rectangle (The size of your steel guitar plus 6-8" on all 4 sides.) Sew 4 seams at the corners cut out the 4 sections of extra fabric and you are done! I have made some denim, some fake leather and one beautiful red crushed leather with fancy white dingle ball trim. FUNNY TRUE STORY: I was playing a bar gig in Bakersfield, and I always covered my Pedal steel during our 15 minute breaks. One night a well dressed couple walked up to the stage and the man grabbed my beautiful red velvet cover, draped it over his date's shoulders as they danced to the jukebox. I figured it was a joke and thought he would give it back after the song, but they disappeared into the crowd and my cover was gone! 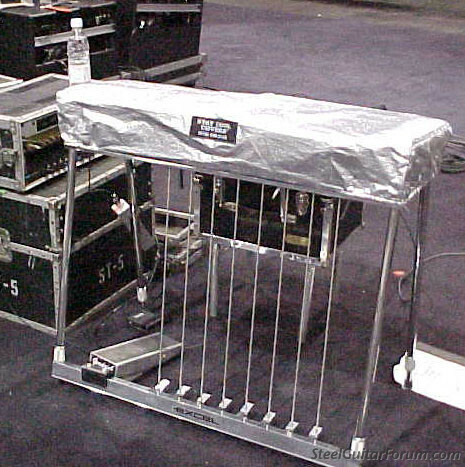 That is why we shouldn't complain about pedal steel's being heavy!!!! I cover my lap steels with a sheet......I sleep with them! HA HA! For the Shobud I have a thick vinyl cover that has a white felt backing and the bottom edges are garterized to cling to the guitar. Had a shop that sells fabrics make it. But most of the time it's not covered, sits in the studio until my OCD kicks in and I got to wipe it down. Sometimes I'll take a vacuum to it. But like the other voyeurs on the list I like to look at it. This will take you back a day or two but its what I cover mine with. I use the Stay Cool cover from Jeff Surratt. It is the best I've owned. I usually use a towel, but after reading this thread, I think one of those vinyl table cloths with the felt backing might work really well. Maybe even one with a Hawaiian motif (lap steel) or, for PSG, a country print with cows or tractors. The options are almost unlimited! I made a cover out of some black leather-looking vinyl with the fuzzy backing. The only time I use it is if I am leaving a guitar set up at my band's practice room for a week. I never cover my guitars at home. My guitars are prettier than than the cover, and seeing one uncovered inspires me to sit down behind it more than if it was covered.